As I read advice from thriving bloggers, so many times they encourage us to find our niche in the blog world. Sort of like finding a theme and running with it, right? When we first moved into this house, I made every room have a theme. I visited a friend in our couple's small group back in the day who was a real live interior designer (who was going back to school to become a teacher, but I digress...) and her living room was nautical themed. Complete with light houses and wooden sailboats. I came home and turned our study into Lighthouse Heaven. I'm talking lighthouses everywhere. Clock. Lighthouse. Fan pull. Lighthouse. Art on walls. Lighthouse. Art on shelves. Lighthouse. I think you get the picture. It was so themy that I purposefully now (a dozen years later) go about my design adventures with an anti-theme agenda. I guess my dilemma is that I don't really have one thing I'm really, really good at. I dabble here and there. I take photographs. I paint. I stamp. I bake. I mother. I taxi. I ... I do a lot of different things. I don't have a niche. In life. And if that's the case, how do I find a niche on my blog?? I say all this, because this week I've been working on a gift for Sashi. OK, primarily, it's been my attempt to both give a cheap-o gift (that doesn't break the bank OR add to our toy collection...) AND to start the bedroom makeover for Pooks. So, giving a gift to Sashi that coordinates with the bedroom 'theme' (Oh Lord) AND qualifies for the birthday gift is just BONUS AWESOME! It's based on a photograph. So: I take pictures. This one will be cropped and, in a sepia tone, will adorn a velvety center in the frame above. 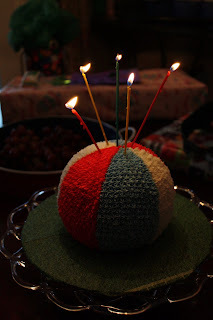 I hosted a party for the family last week that centered around the birthday girl AND some doll-gone awesome ribs. So, I can cook (at least sometimes...). And I do bake. 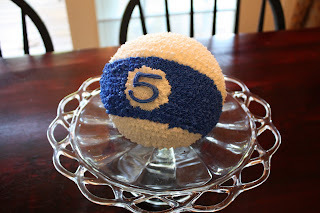 I have pictures of a few of my recent ball cake adventures (Meiners helped with both...)! All this to say ~ Do you have a blogging niche? How did you find it? Perhaps I've already found mine and I don't even know it?? God, are you there? It's me, Nicheless.